As we near The Museum of Contemporary Art’s 40th year—I am inspired by the significant history and influence of such a young museum. I am optimistic about building on MOCA’s legacy and expanding our impact in Los Angeles and beyond. I have long seen MOCA as one of the most vital, leading institutions in our field. It is no secret that MOCA has been integral to forming Los Angeles’ expanding and vibrant contemporary art scene, and often central to some of the most critical cultural global dialogues. This has been a pivotal year for MOCA. We welcomed Klaus Biesenbach as our new director, an outstanding appointment for the museum and the city of Los Angeles. Artist and MOCA Trustee Catherine Opie led the search, reflecting MOCA’s ethos as “The Artist’s Museum,” and placing artists at the center of the museum’s mission and vision. MOCA’s history as a place where contemporary artists have a role in shaping the institution is shared by Klaus, who most recently served as Director of MoMA PS1 and Chief Curator at Large at The Museum of Modern Art. I am thrilled that we will be celebrating MOCA’s 40 years with highlights from our history and our collection. 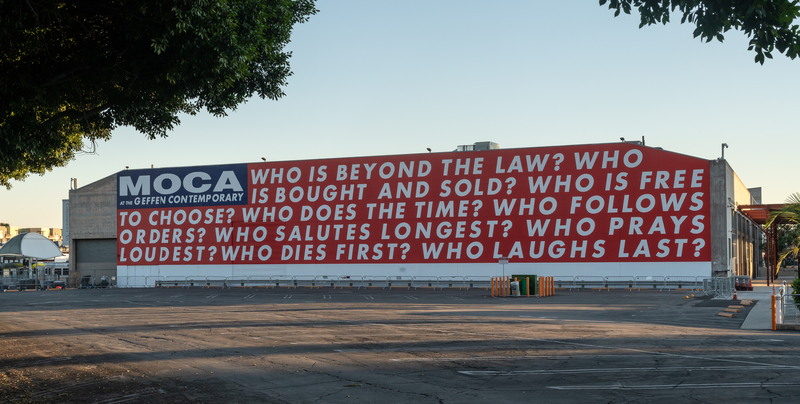 The first example of this is the reinstallation of Barbara Kruger’s iconic work, Untitled (Questions) on the north facade of The Geffen Contemporary at MOCA. It will remain on view through November 2020. The emblematic red, white, and blue artwork was originally commissioned by MOCA in 1989. For me, this work stands for MOCA’s vision for the future and it is a timely symbol of the museum’s ability to engage artists and support their important voice in our society! MOCA’s programs in 2019 will follow this lead, highlighting MOCA’s most influential exhibitions and works in our permanent collection - elucidating the present moment and providing hope as we point to the future. During this significant time of bold change, your support is important more than ever. Every year MOCA welcomes 300,000 visitors and our public programs resonate with diverse voices and visions. Our nationally recognized education programs engage thousands of public school students each year (more than 70% qualifying for free- or reduced-price lunch) and hundreds of teachers each year through The Rebecca Smith Summer Institute, Contemporary Art Start (CAS), and the Teen Program. Your generosity makes all this and more possible! MOCA is worthy of your support. Please join me in supporting The Museum of Contemporary Art, Los Angeles, by making a fully tax-deductible gift today. Thank you for your consideration and past generosity.